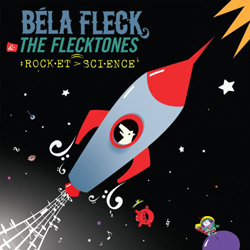 Bela Fleck and the Flecktones' "Rocket Science"
The Flecktones have reemerged with a new album, on a new label, (eOne records) and announcing that for "the first time since 1991, pianist/ harmonica player Howard Levy has returned to the fold alongside bassist Victor Wooten, percussionist/Drumitarist Roy “Futureman” Wooten and banjoist bandleader Fleck to create some of the most forward-thinking music of their long, storied career. While all manners of genres come into play – from classical and jazz to bluegrass and African music to electric blues and Eastern European folk dances – the result is an impossible to pigeonhole sound all their own, a meeting of musical minds that remains, as ever, utterly indescribable. Simply put, it is The Flecktones, the music made only when these four individuals come together."